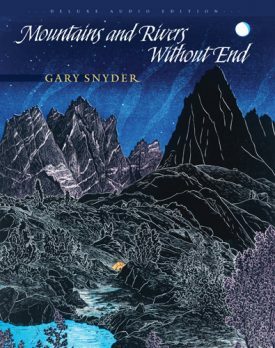 Begun in Berkeley on April 8, 1956, Gary Snyder’s Mountains and Rivers Without End is an epic of geology, prehistory, and mythology. The poems travel beyond Western traditions to encompass Asian art and drama, Native American performance and storytelling, and the practice of Zen Buddhism. It is a moving celebration of earth and sky, rock and water, nature and humanity from one of America’s finest poets. When the first edition of this landmark work was published in 1996, Gary Snyder was honored with the Bollingen Poetry Prize, the Robert Kirsch Lifetime Achievement Award from the Los Angeles Times, the Orion Society’s John Hay Award, and many other awards. In this new edition, we celebrate again the brilliance of one of our most important poets. GARY SNYDER is the author of sixteen collections of poetry and prose. Winner of the Pulitzer Prize in 1975 and a finalist for the National Book Critics Circle Award in 1992 and 2005, he has been awarded the Bollingen Poetry Prize, the Robert Kirsch Lifetime Achievement Award, and the 2004 Japanese Masaoka Shiki International Haiku Grand Prize. He has lived in the foothills of the Sierra Nevada since 1970.